Finally, another giveaway for my amazing followers! I know it has been a long time since the last one, but this is a great prize to win. 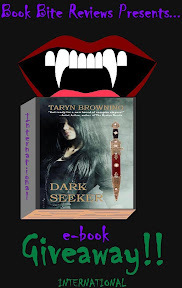 Todays prize is an e-copy of Dark Seeker by Taryn Browning, you can receive it in any e-format you prefer (kindle, pdf, etc.,), and you will also win a signed bookmark for her newest release Whispering Hills. This giveaway is open internationally and Please read the guidelines below before entering! To read my review of Dark Seeker click here!! If you win you will need to give me your home address for me to send to the author so that they can sign & send you the bookmark, but i will only ask for your address if you win and neither of us will share it with anyone. If you are under 18 please make sure that it is ok with your parents to give out your home address.